Image retrieved from www.remarkableohio.org on February 3rd, 2014. Image retrieved from bloog.daimler.de on February 3rd, 2013. Image retrieved from www.madeyoulaugh.com on February 3rd, 2014. Image retrieved from www.hempcar.org on February 3rd, 2014. Image retrieved from upload.wikimedia.org on February 3rd, 2014. Hemp oil and alcohol made from fermented plants are feasible alternatives to traditional energy, and could eliminate the dependence of developed countries on imported crude oil. By using alcohol made from fermented hemp and diesel oil from pressed seeds, domestic oil reserves and other alternative fuels, we could become self -sufficient. Further more, many of the alternative fuels are cheaper to make. The fuel of the future, according to Henry Ford and General Motors' scientist Charles F Kettering, was ethyl alcohol made from farm products, and cellulose materials. Henry Ford's support for alternative fuel sources culminated in the Dearborn, Michigan, "Chemurgy" conferences in the 1930s. By then, alcohol-powered vehicles had been used in Europe for some 50 years, and, until oil prices dropped to near giveaway levels after World War II, Ethyl alcohol was a serious contender as a major fuel source. When Henry Ford told a New York Times reporter that ethyl alcohol was "the fuel of the future" in 1925, he expressed an opinion widely shared in the automotive industry. "The fuel of the future is going to come from fruit like that sumach out by the road, or from apples, weeds, sawdust--almost anything," he said. "There is fuel in every bit of vegetable matter that can be fermented. There's enough alcohol in one year's yield of an acre of potatoes to drive the machinery necessary to cultivate the fields for a hundred years." Ford wanted to open up new markets for American farmers, who were already faced with a crisis that would continue to worsen throughout the 1930s, and is back again: commodity prices that are, in real terms, as low as they were five centuries ago. Three times in the past century, American farmers, business leaders, policy makers, and the public seemed ready to give alcohol fuels a chance; at the turn of the 20th century, as different types of cars went on the market; in the 1930s, with Henry Ford's blessing; and during the oil-price crunch of the 1970s and early 1980s. Each time, cheap gasoline undermined the alcohol industry. "Gasahol" development took off in Canada and the United States each time, and , in the 1980s, more that 100 corn-alcohol production plants were built in the United States and over one billion gallons of ethyl alcohol were sold per year for fuel. In Canada, some regional gasoline companies began selling gas-alcohol mixtures, which offer the anti-knock qualities of high octane fuel and prevent freezing of gas lines. Gasahol production was even an issue in the 1981 Ontario, Canada, provincial election, pushed by the opposition Liberals. However, oil and gas prices plunged in the late 1980s, not only stalling alcohol conversion but also hampering natural gas and hydrogen conversion. Ethyl alcohol can replace gasoline in two ways: in modified internal combustion engines, and as an additive to gasoline in blends of 10 to 30 percent. It's not a new concept; "gasonol" was a blend of 20 percent sugar cane alcohol with gasoline and kerosene used in the Philippines in the 1930s. Koolmotor, Bensalcool, Moltaco, Lattybentyl, Natelite, Alcool, and Agrol were alcohol gasoline fuels sold in Britain, Italy, Hungary, Sweden, South Africa, Brazil, and the U.S. in the 1920s and 1930s. Alcohol was an important fuel before the invention of the car. In the first half of the 19th century, before petroleum was discovered in Ontario and Ohio, the leading fuel was "camphene" (sometimes simply called "burning fluid"). It was a blend of high-proof ethyl alcohol with 20 to 50 percent turpentine to color the flame and a few drops of camphor oil to mask the turpentine smell. Alcohol for camphene was an important mainstay for distilleries, and many sold between one-third and 80 percent of their product on the fuel market. In the 1830s, various alcohol blends, which were much cleaner, had replaced increasingly expensive whale oil in most parts of the United States. In the 1850s, camphene (at $.50 per gallon) was cheaper than whale oil ($1.30 to $2.50 per gallon) and lard oil (90 cents per gallon). The Canadian invention, kerosene, came on the market at the same time. It was made from coal oil and cost about the same as alcohol, with the added benefit that it was not nearly as volatile. Alcohol might have kept a hefty share of the market, but a $2.08-a-gallon tax imposed on beverage alcohol during the Civil War also applied to industrial alcohol and effectively killed the lamp alcohol business. In Europe, where there was no such tax, alcohol was a ready fuel when the internal combustion engine was developed. Samuel Morey developed the first internal combustion engine in the United States in the 1820s. It ran on ethyl alcohol and turpentine and powered an experimental wagon and a small boat at eight miles (12.8 kilometers) per hour up the Connecticut River. However, potential financial backers kept their money in steamships and railways, and Morey's invention stayed on the shelf. In the 1860s German inventor Nicholas August Otto developed an internal combustion engine that used vaporized alcohol, but he could not get a patent from the Kingdom of Prussia. American inventor George Brayton developed an engine in the 1870s, but used gasoline, a petroleum by-product that was cheap because no one had yet found a use for the dangerously volatile fluid. In Europe, where all petroleum products were relatively expensive, work on alcohol motors continued. Thirty percent of the locomotive engines produced by the Otto Gas Engine Works in Germany ran on alcohol. One-third of the heavy locomotives produced at the Deutz Gas engine works of Germany ran on pure ethyl alcohol, and much of the World War I German military equipment used alcohol for fuel. When oil shortages seemed likely to paralyze Germany's transportation system in 1915, thousands of engines were quickly modified. "Every motor car in the empire was adapted to run on alcohol. It is possible that Germany would have been beaten already (by 1917) if production of alcohol had not formed an important part of the agricultural economy," Irish historian George Tweedy later wrote. A representative of the Detroit Board of Commerce, James S. Capen, told the Senate Finance Committee that alcohol was "preferable" to gasoline because it was safer, "absolutely clean and sanitary," and because alcohol fuel went on sale in Peoria, Illinois, at 32 cents per gallon in January 1907 as the tax took effect, and prices elsewhere in the States hovered around 25 to 30 cents. At the same time, gasoline prices of 18 to 22 cents per gallon were beginning to drop as new Texas oil fields came on line and found markets on the east Coast. In Germany in 1926, a commercial fuel called Monopolin was introduced and "favorably received due to its anti-knock qualities." The fuel, which included I.G. Farben's octane-boosting iron carbonyl additive, was endorsed by a famous race car driver of the era, Herbert Ernst, and alcohol use in fuel climbed from 250,000 gallons in 1923 to 46 million gallons in 1932. In 1930 gasoline importers were required to buy from 2.5 to 6 percent alcohol relative to their gasoline import volumes to use in blends. In 1933, I.G. Farben and several oil companies acquired 51 percent of Monopolin. Production of alcohol did not diminish but by 1937 had climbed to about 52 million gallons per year as part of Hitler's war preparations. The total use of alcohol as a substitute fuel in Europe may have never exceeded 5 percent, according to the American petroleum Institute. Synthetic gasoline and benzene created by I.G. Farben from coal substituted for 7 percent and 6.5 percent respectively of European petroleum by 1937. Synthetic gasoline was cheaper (at 17 to 19 cents per gallon) than alcohol at around 25 cents per gallon, API says. By 1937 motorists from Indiana to South Dakota were urged to use Agrol, an ethyl alcohol blend with gasoline. Two types were available--Agrol 5, with 5 to 7 percent alcohol, and Agrol 10, with 12.5 to 17 percent alcohol. "Try a tankful--you'll be thankful, ' the Agrol brochures said. The blend was sold to high initial enthusiasm at 2,000 service stations. While it is true that a number of foreign countries process agricultural materials for the production of alcohol as a motor fuel, it is equally true that the motor fuel economy of countries possessing no petroleum resources is very different from such economy in the United States. It has never been established in this country that the conversion of agricultural products into motor fuel is economically feasible or necessary for national defense. On the other hand, it has been recognized for a long time that a real need exists in this country for the development of all the information possible on this very contentious subject. Roosevelt's intense political feud with the Republican forces who backed Chemurgy in the 1930s led him to oppose virtually any thing the Midwestern Republicans advanced, but Roosevelt's judgment was premature and wrong. Editorials by Lowell Thomas and other radio announcers paid for by oil industry sponsors claimed that alcohol fuel would make "speakeasys" out of gasoline stations because bootleggers could easily separate out the gasoline and sell the alcohol. Thomas said: "The automobile manufacturer resents it [alcohol] because it interferes with the horsepower of the motorist's car, requires extensive carburetor changes and presents other difficulties..." (In fact, this might be true of pure alcohol but not alcohol blends with gasoline). Thomas's radio address was recorded in a cable sent from Sun Oil Co.'s J. Howard Pew to H.D. Collier, president of Standard Oil Co. of California, on April 26, 1933. In its 1980 revival, gasohol never got far enough to worry the oil companies. A few added small amounts of alcohol to gasoline and pocketed windfall profits, since alcohol was not hit by the excise taxes that governments pile onto gasoline. Still, alternative energy advocates could not compete with the clout of oil companies. The corporations hire the best lobbyists and give generously to political parties. Former oil executives hold key positions in Washington. But governments have another reason to keep the petroleum flowing. Tax revenues--almost always a percentage of the pump price--rise with every price increase. It costs less than 60 cents a barrel to extract a barrel of oil from the deserts of Kuwait and get it onto a supertanker. Every cent made on top of that goes to people with a vested interest in maintaining the status quo: producing countries, supertanker and pipeline owners, oil companies, refiners, and governments. The military gets money to protect this traffic; everyone gets a piece of the action except the consumer. The cost to the environment from oil-field pollution, pipeline leaks, tanker wrecks, refinery effluent, and air pollution, are rarely factored in. Hemp oil and gasohol advocates have come up with some very creative ways to drive home the message that the West does not need to be held hostage by the repressive and often hostile regimes that control the bulk of the world's fossil fuel. 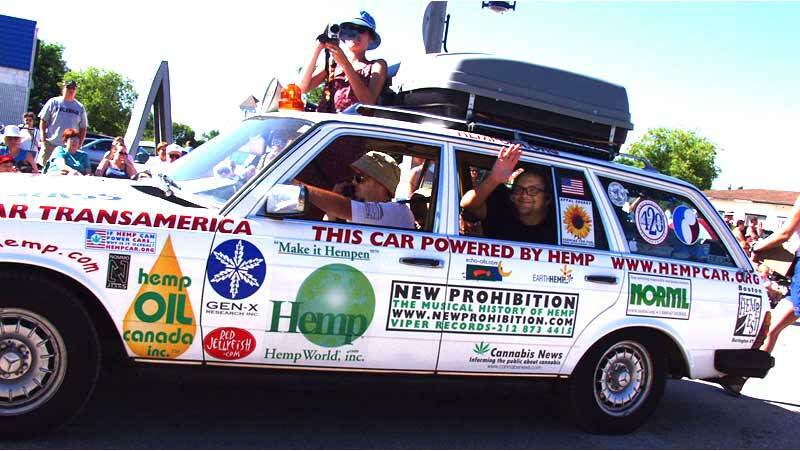 In 2000, Grayson Sigler and Kellie Ogilvie created the Hempcar to show the American public an alternative. After a 10,000-mile (16,000-kilometer) journey around the continent beginning in Washington, D.C., on July 4, 2001, they took the car to Japan. "If hemp were legal to grow in the U.S., technologies such as pyrolysis would make hemp fuels economically competitive with petrol fuels, " says Sigler. "The emissions associated with the use of hemp fuels are far less toxic than for fossil fuels, and hemp helps slow down global warming by absorbing CO2 from the air while it is growing. Pyrolysis is the thermochemical process that converts organic materials into usable fuels with high fuel-to-feed ratios, making it the most efficient process for biomass conversion, and the method most capable of competing with and eventually replacing nonrenewable fossil fuel resources. Chemical decomposition through pyrolysis is the same technology used to refine crude fossil fuel oil and coal. Pyrolysis of wood to produce charcoal was a major industry in the 1800s, supplying the fuel for the Industrial revolution, until charcoal was replaced by coal. So, can we look forward to filling up our tanks with hemp oil? "Not in the next decade," Sigler told news reporters when he began his voyage. "Prohibition has made hemp oil quite expensive, and the glut of petroleum fuels exacerbates the problem." Recently Joshua and Kaia Tickell built the "Veggie Van," a fryer-grease-powered Winnebago that logged over 25,00 miles (40,200 kilometers) promoting the "biodiesel" concept in the U.S. It could just as easily run on hemp seed oil, either directly from seed presses or after it's been used for frying. Biodiesel is the name for a variety of ester-based oxygenated fuels made from hemp oil, other vegetable oils, or animal fats. The concept of using vegetable as engine fuel dates back to 1895 when Dr. Rudolf Diesel developed the first diesel engine to run on vegetable oil. Diesel demonstrated his engine at the World Exhibition in Paris in 1900, using peanut oil as fuel. Because it has properties similar to petroleum diesel fuel, biodiesel can be blended in any ratio with petroleum diesel fuel. In fact, many federal and state fleet vehicles are already using biodiesel blends in their existing diesel engines. The low emissions of biodiesel make it an ideal fuel for use in marine areas, national parks and forests, and heavily polluted cites. Biodiesel has many advantages as a transport fuel. For example, it can be produced from domestically grown oilseed plants such as hemp. When burned in a diesel engine, biodiesel replaces the exhaust odor of petroleum diesel with the pleasant smell of hemp, popcorn, or French fries. The industrial world currently runs on fossil fuel: natural gas, oil and coal. Fossil fuel resources are nonrenewable and contain varying levels of sulfur, which is the source of many of the environmental pollution problems threatening much of the world. Removing sulfur compounds from fossil fuels is a major expense to the energy producers. Fossil-plant carbon—coal--is one of Earth's ways of storing carbon dioxide. When coal is burned, this carbon dioxide is added to the Earth's atmosphere. And, since many of the world's forests are being cleared, nature has no way to lock the CO2 away—it's added to the brew of greenhouse gases. It is likely that peak oil and gas production in the United States has been reached. The oil fields of Texas, Oklahoma, and Ohio are being pumped at their capacity, and the only major oil fields that are undeveloped are in environmentally-sensitive parts of the continental shelf and Alaska. The situation for recoverable coal, worldwide, is more favorable. Peak production is estimated to happen shortly after 2100. The costs of environmental pollution and destruction associated with coal-fired industries are simply too high: acid rain, smog, greenhouse gases, and strip-mined land. Even if the pollution problems of fossil fuel are solved, the financial costs of this form of energy will still rise because of the dwindling availability of this nonrenewable world resource, but the dollar cost of energy production from biomass conversion will remain relatively constant because the world biomass resource is renewable on a yearly basis. However, the automobile industry is hooked on cheap gasoline. Oil companies are in the business of taking fuel from the ground, not squeezing it from seeds or distilling it from fermented plants. U.S. Foreign policy is geared to ensuring “stability” in regions that are prepared to guarantee a steady flow of relatively cheap energy. In 1979, Stanford Research Institute conducted a Mission Analysis study for the U.S. Department of Energy. The scientists chose five types of biomass materials to investigate for energy conversion woody plants, herbaceous plants (those that do not produce persistent woody material), aquatic plants, and manure. Herbaceous plants were divided into two categories: those with low moisture content and those with high moisture content. Biomass conversion may be conducted on two broad pathways: chemical decomposition and biological digestion. Chemical decomposition can be utilized for energy conversion of all five categories of biomass materials, but low-moisture herbaceous (small grain field residues) and woody (wood industry wastes, and standing vegetation not suitable for lumber are the most suitable. Biological processes are essentially microbic digestion and fermentation. High-moisture herbaceous plants (vegetables, sugarcane, sugar beet, corn, sorghum, cotton), marine crops and manure are most suitable for biological digestion. Anaerobic digestion produces high and intermediate BTU gases. (High-BTU gas is methane; intermediate-BTU gas comprises methane mixed with carbon monoxide and carbon dioxide.) Methane can be efficiently converted into methanol, Which can be used as a propane or natural gas replacement. Fermentation produces ethyl and other alcohols, but the process is too costly in terms of cultivated land use and too inefficient in terms of alcohol production to feasibly supply enough fuel alcohol to power industrial society. To be most efficient, farmers should be encouraged to grow energy crops capable of producing 10 tons per acre in 10 to 120 days. The crop would have to be naturally high in cellulose, grow in almost all climactic zones in the United States, and not compete with food production for the most fertile land. Since hemp grows well on marginal soil, it could be grown in rotation with food crops or on land where other crop production isn't profitable. So why don't we have methanol at the filling station? The scientists said the problem was government certification under the Clean Air Act that required the automobile manufacturers to meet standards set by the EPA based on fuels available on a national level. Since methanol fuel standards had not been set, the car makers couldn't make the new fleet until the methanol fuel was available at the pump. This catch-22 situation continues today. Government is unwilling to subsidize pilot energy farms and biomass refinery construction because fossil fuel producers control the energy industry. The danger of the reliance on fossil fuels is obvious: economic uncertainty from fluctuating prices; political instability and war in the Middle East; environmental damage from oil fields, refineries, and oil tanker spills. And, as the United States goes, so does Canada, Europe, and the rest of the developed world. William Reilly, then chief of the Environmental Protection Agency , estimated the cost of the plan would be between $14 billion and $19 billion a year. Bush said, “Too many Americans continue to breathe dirty air, and political paralysis has plagued further progress against air pollution. We've seen enough of this stalemate. It's time to clear the air.” but, when Bush lost the election, the idea was not picked up by President Bill Clinton, Nor has it been revived by George W. Bush, despite the troubles in the Middle East. Biomass and seed oil fuel advocates say the energy needs of the United states - by far the world's largest consumer of fossil fuels —could be met by farming about 6 percent of the land mass of the lower 48 states. This production would not add any net carbon dioxide to the atmosphere. The best biomass producer per acre, on prime or marginal farmland, is probably hemp.